There’s always room in the recipe file for a simple dessert. Something you can knock out in no time, without much thought, pulling ingredients from the pantry and freezer. One that is easy, delicious and above all things, quick. Look no further; this is that recipe. Puff pastry, fresh fruit or canned, a little almond paste. Perhaps not things you have lying around all the time but certainly easy items to stash away for emergency dessert needs. In my opinion, there absolutely are dessert emergencies. They happen more frequently than I care to admit. This is a variation on a recipe developed by my friend and sometime employer Gale Gand that we’ve been doing lately at events and food festivals. It’s a good recipe and a crowd pleaser, one that can be rustic or elegant as the situation demands. Really, it’s just a fruit and a little almond cream nestled in puff pastry. Classic components, classic flavors. 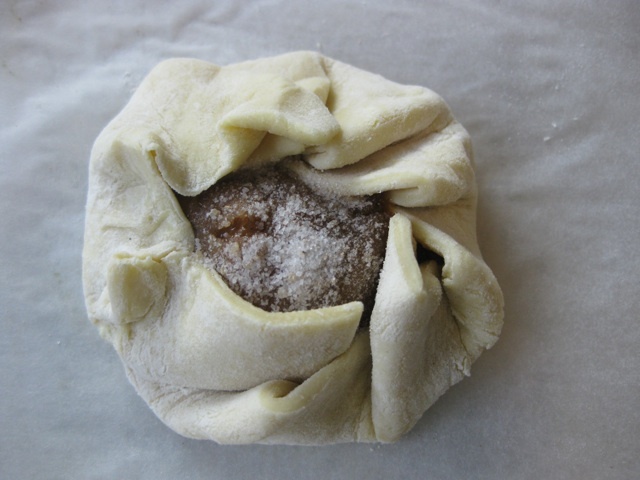 There’s no special technique or skill involved in folding the pastry – just gather it up around the fruit and give it a good push to hold. I’ve tried fancy pleating – just can’t help myself sometimes – but the pastry just puffs up in the oven anyway, making the pleating pointless. It’s really very simple despite my best efforts to overcomplicate. I’ve altered the recipe and the technique a bit from the original to suit my taste and methods. The fruit can be varied – we’ve been using fresh pears – but a jar of vanilla poached apricots I canned last summer has been begging to be used in something pretty. I really love the combination of apricots and almond and though the fruit was a bit soft due to my canning method, they were rather wonderful. The fruit baked up soft and jammy, very cozy with a cup of tea. The sugar/spice mixture can be varied to your tastes. If you have pumpkin pie spice hanging around after the holidays, this is a good use for it. I had a vanilla sugar/turbinado combination leftover from a baking project, so I used that. 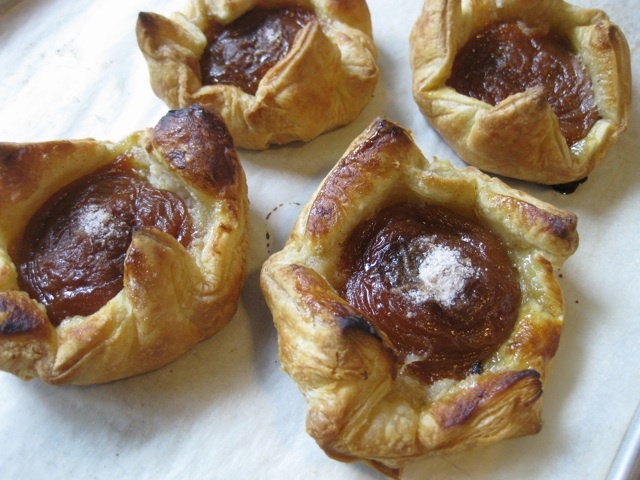 The tarts can be baked off several hours ahead and really are best the day they’re baked. 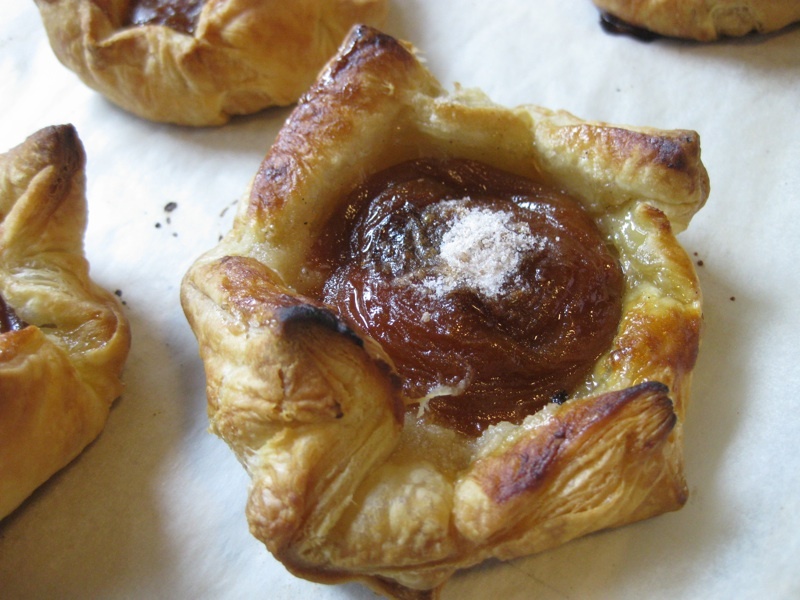 While still delicious, the pastry tends to loose its crispness over time. Think beyond dinner too … they’re rather lovely for breakfast or a snack. If you ask me, I think they’re rather perfect for just about any time. This can go from a rustic breakfast treat to a fancy plated dessert in no time. Elevate it with the plating – make a crème anglaise or perhaps a caramel sauce to serve alongside. Not so rustic anymore. A quick note on puff pastry – while Pepperidge Farm is available everywhere and certainly works here, seek out an all-butter pastry if you can. Trader Joe’s has a nice one and Whole Foods has an excellent – and expensive – one as well. Or make your own. Blitz puff pastry isn’t all that complicated, infinitely better than store bought and is a wonderful thing to have tucked away in the freezer. STRESS BAKING THERAPY FACTOR: A KEEPER. It’s quick, easy and impressive. This is the one you throw in when the dinner menu you’ve devised is ridiculously overcomplicated and you need to ease back on the last course without anyone having the slightest idea. Line a sheet pan with a piece of parchment paper and set aside until needed. In a small bowl, combine the almond paste and sour cream, mashing it together with a spoon until mostly smooth. In another small bowl, combine the sugar, cinnamon, nutmeg and allspice. Set aside. Unfold the puff pastry and give it a few passes with a rolling pin on a lightly floured surface to even out any creases. 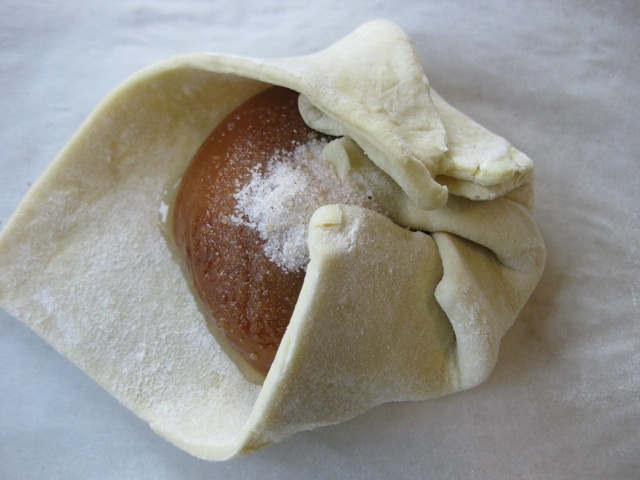 Spoon ¼ of the almond/sour cream mixture into the center of each pastry square and smooth into a 2” circle. Sprinkle about 1 teaspoon of the sugar mixture on top of the almond cream. Top with an apricot half, cut side down. Top each apricot with a sprinkle of the sugar mixture. 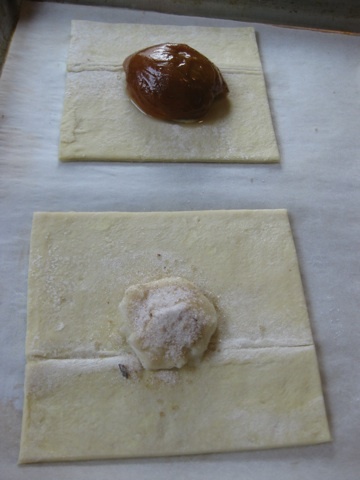 Gather the puff pastry up around the apricot, folding to enclose the fruit neatly and press around the fruit to enclose. Don’t try to pleat the pastry prettily as it won’t hold during baking but it will puff up around the fruit and look quite nice when done. Let cool before serving, dusting with powered sugar if you like.